1A NSL 748 sb. 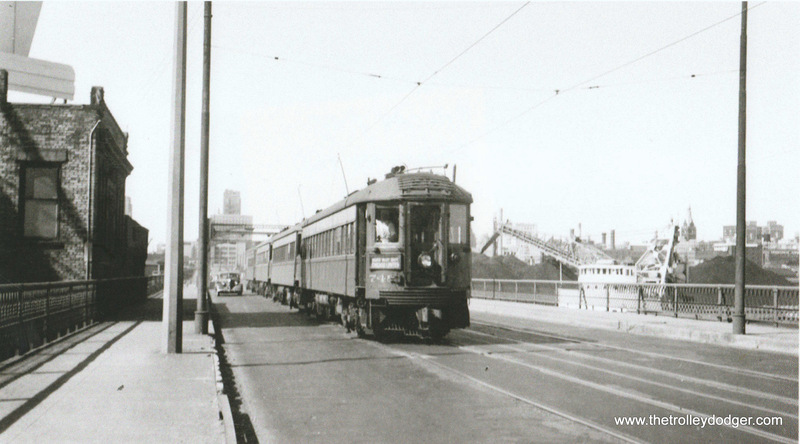 on 6th St. Viaduct at Canal St. 8-12-51 Don Ross. 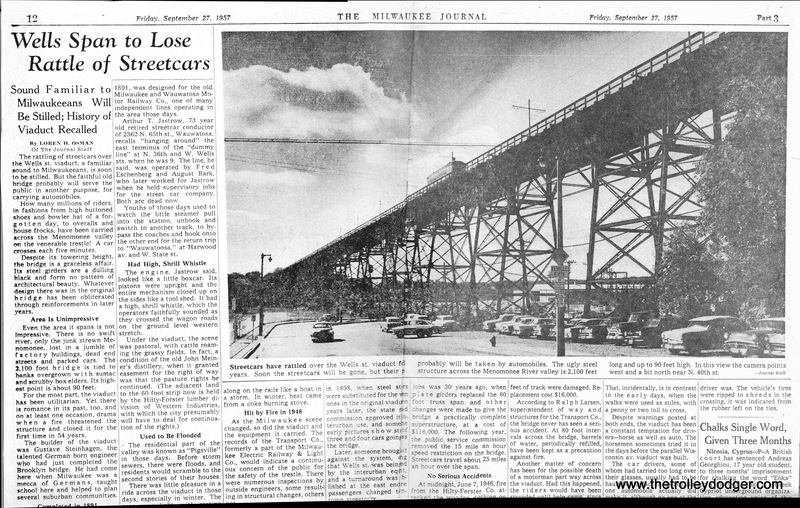 Editor’s Note: Today’s post is by guest contributor Larry Sakar, author of Speedrail: Milwaukee’s Last Rapid Transit? (published in 1991 by Interurbans Press). We thank Larry, Chris Barney, and Don Ross for sharing their information with our readers. 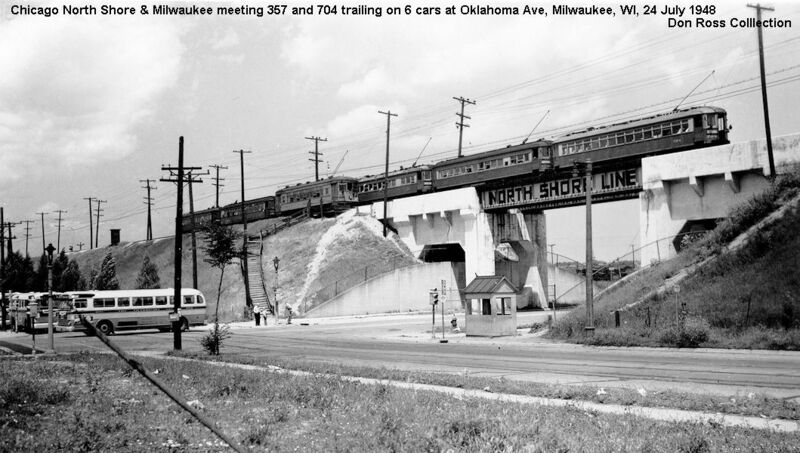 January 21 of 2018 marks the sad 55th anniversary of the end of the North Shore Line. 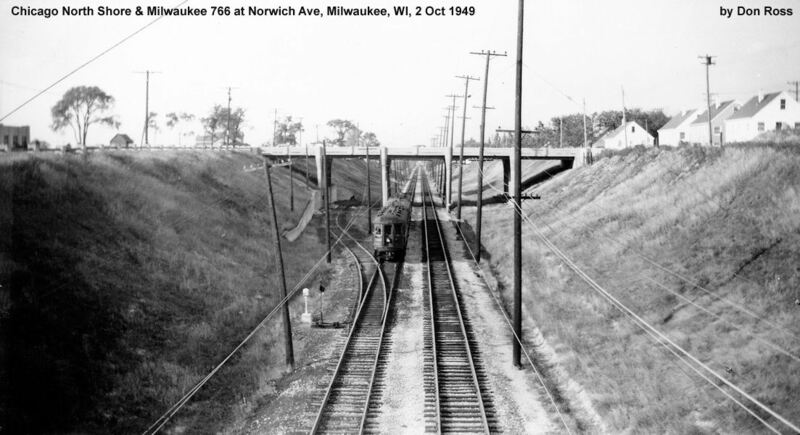 I was 12 years old when the line was abandoned and neither rode nor saw it in operation as I grew up on Milwaukee’s northwest side nowhere near the NSL. But as a traction fan it is one of my favorites. 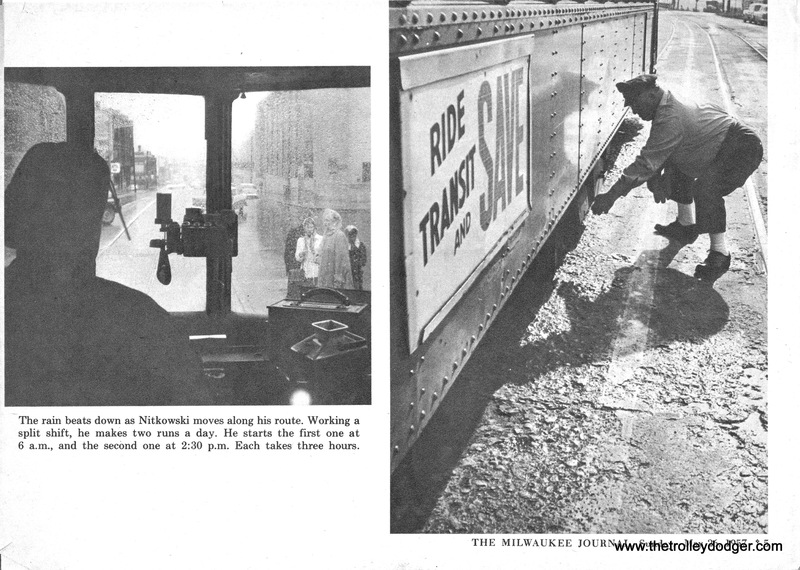 Here is a group of photos of the North Shore Line in service mostly in the city of Milwaukee. Each “Then” photo will be followed by one or more photos showing that same location in 2017. In a few cases the only thing changed is that the North Shore Line is missing. 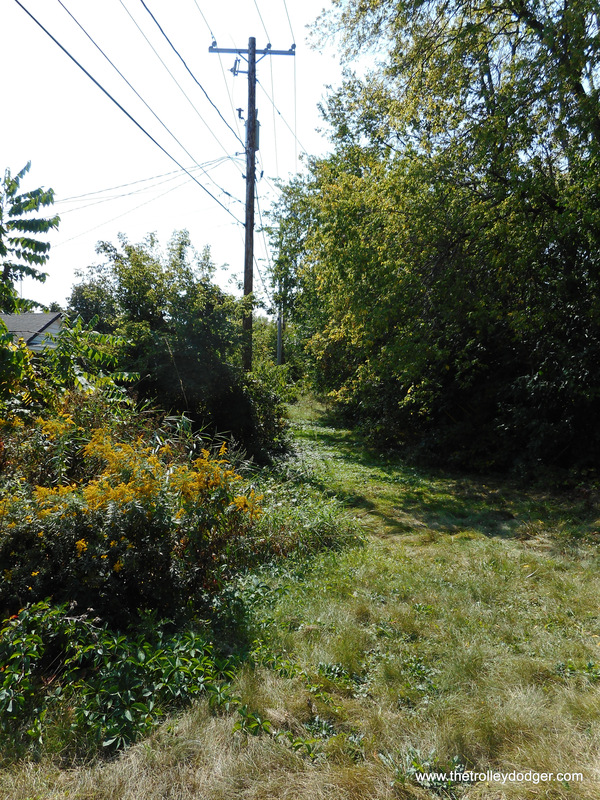 In others, not even the abandoned right-of-way remains. “Then ” pictures were taken by the photographers credited. All present day photos were taken by my friend and colleague, Chris Barney. There are 36 pictures total. 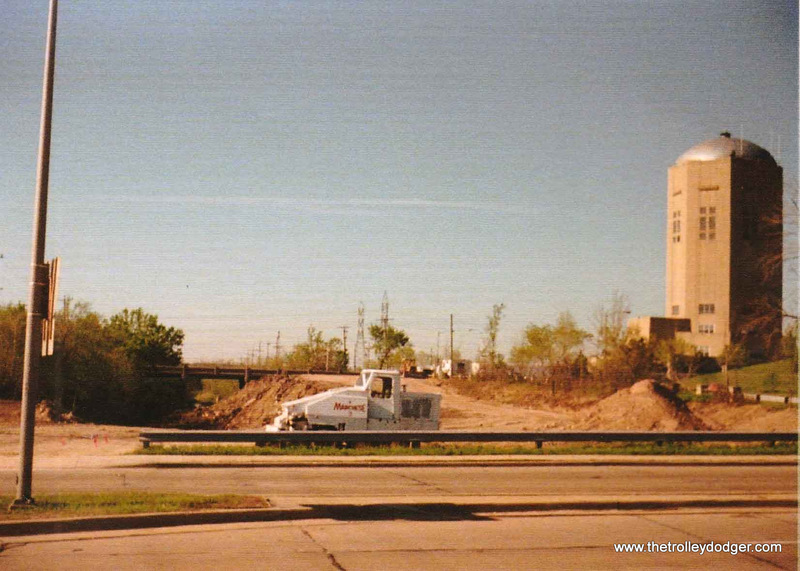 One original “Then” for each location and several views of how that location looks today. In some cases just one “Now” shot in others-more. 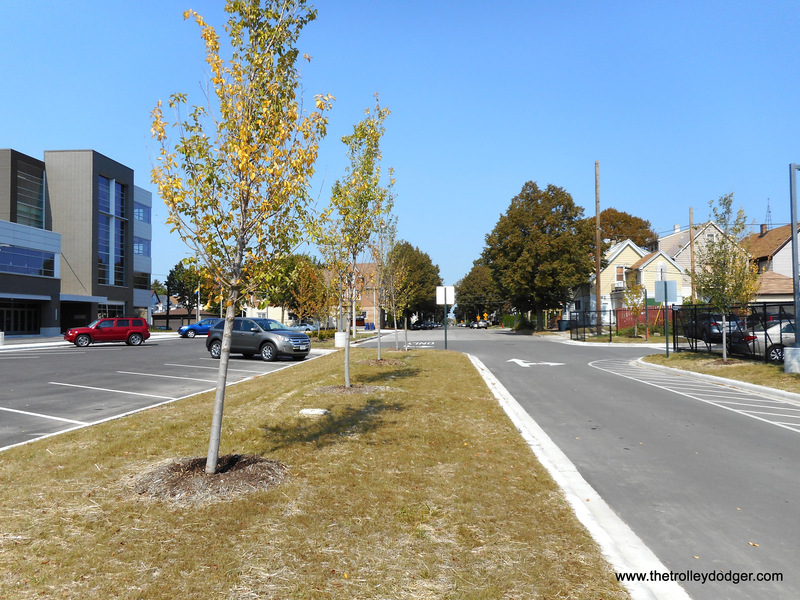 There wasn’t room to put in details about the site of the Harrison St. shops (5th St & Harrison Ave.). After being vacant since the former shops building was torn down around 1968, a private school bought the entire property and began building a charter school along the west side of the property extending all the way to the southeast corner of 6th & Harrison. The school will open for students next Fall (2018). Chris Barney took every one of the present day photos and did an excellent job of matching them to the “Then” shots. There are about 3 or 4 pics that did not scan well. #’s 7B & 7C are light. Both are scans of photocopies. They are from a microfilm that Milwaukee Public Library received in 1995. One day out of the blue the librarian who was then in charge of the Local History room called me. 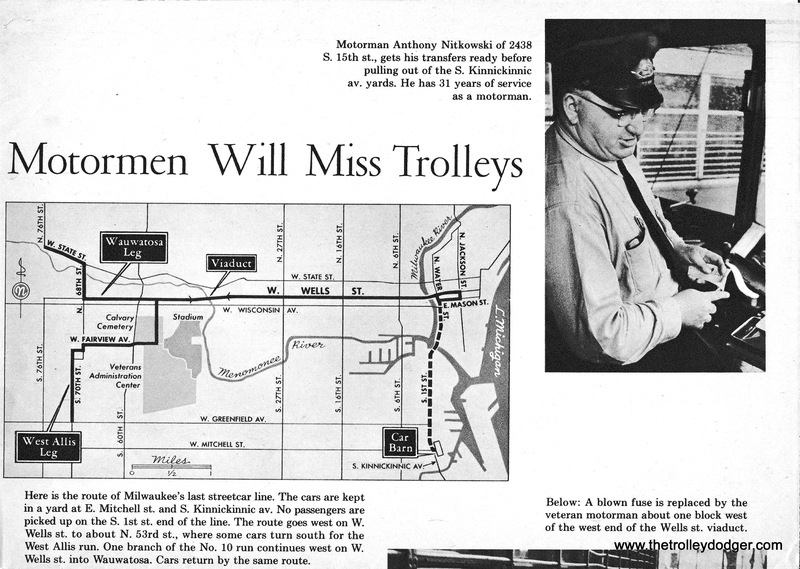 They had received this microfilm (roll film) entitled, “Subways Along Milwaukee Rapid Transit Lines.” I couldn’t understand what that could be since there was only one subway which never got any further than about a half block east of 8th & Hibernia Sts. 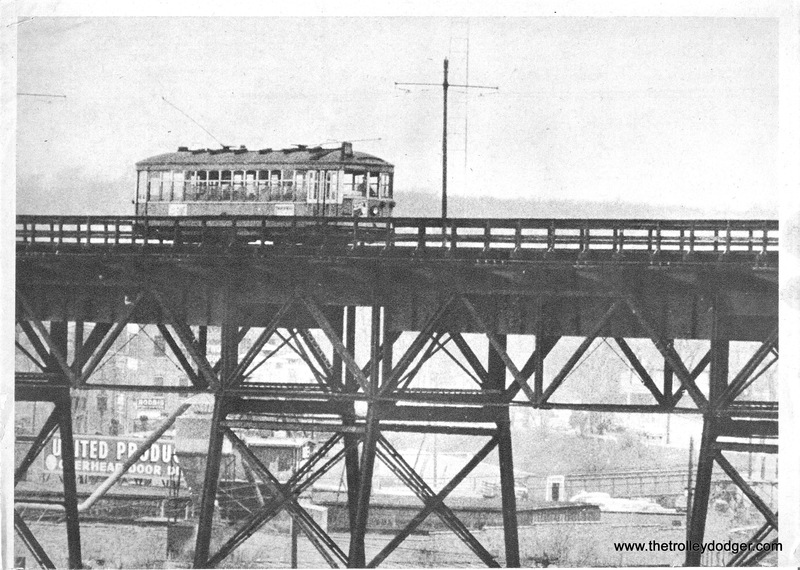 As it turned out “subways” was a term for the bridges the Rapid Transit Lines crossed at streets. 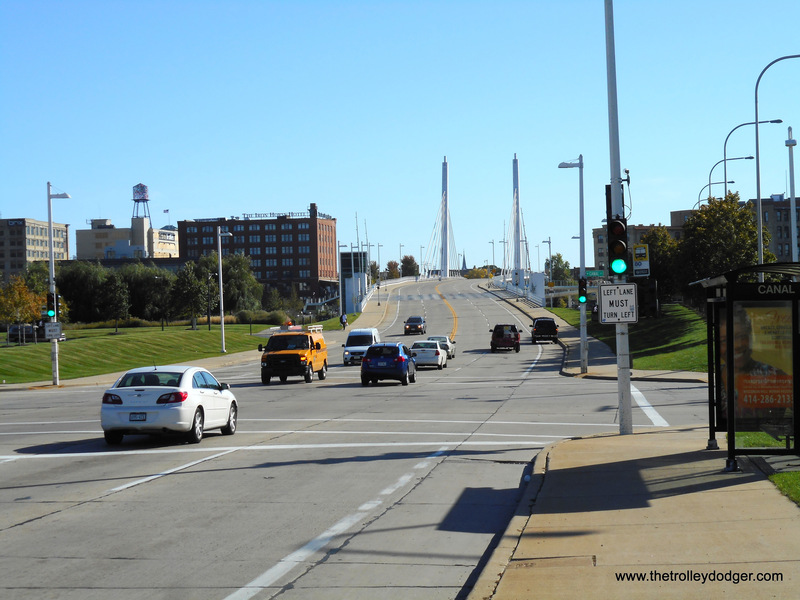 The purpose seemed to be to determine the clearance height that could be posted on the bridge but if that is so why were shots included at 16th, 27th & 35th Sts. 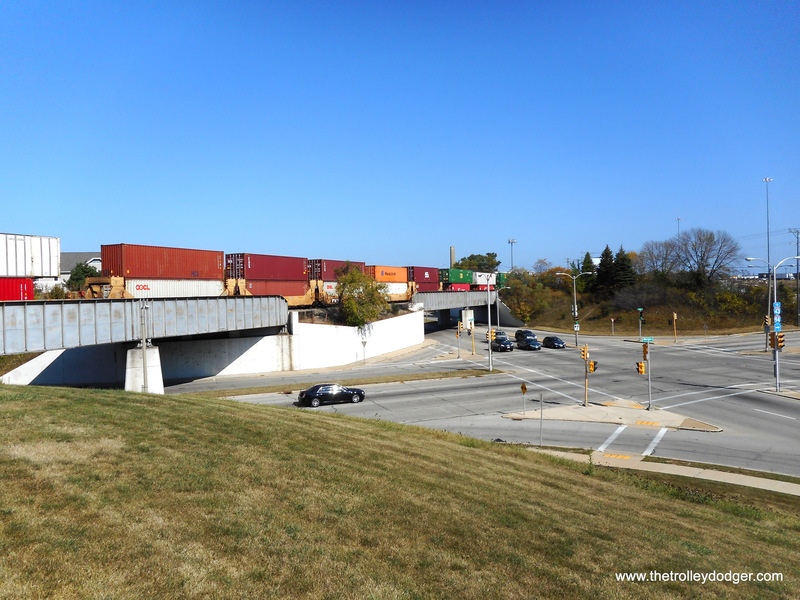 and other locations where the Rapid Transit passed under the road? You wouldn’t need any clearance signs there. The Port Washington, MRK and Local Rapid Transit Lines of TM and the North Shore as far as College Ave. were all included. I copied almost every image on the film. 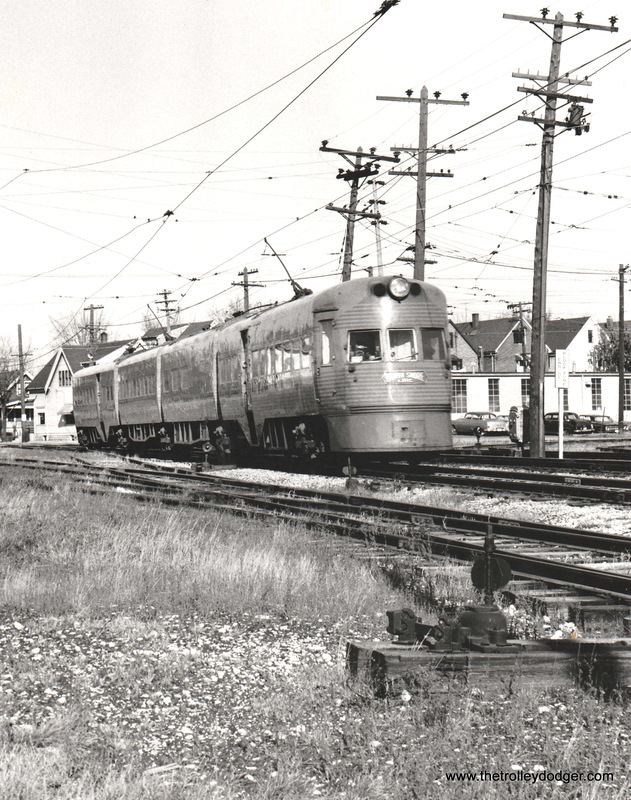 At the time I was part of TMER&THS The Milwaukee Electric Railway & Transit Historical Society. I obtained permission to have the film copied for them. It came out bad. It had an old silver negative which did not copy well. I returned the film to MPL and kind of forgot about it. A few years sgo I asked about it and nobody knew anything about it. It just vanished without ever being cataloged into the MPL collection and no one there now was there then. What TMER&THS did with their copy I do not know. I left the organization 14 years ago. I hope you’ll like Chris’ and my efforts. 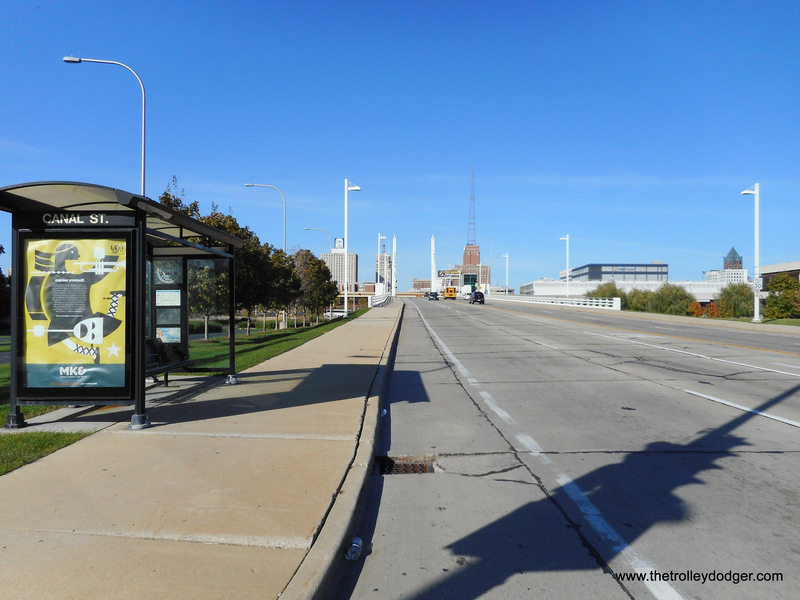 The pictures are arranged geographically from downtown Milwaukee to Howell & Rawson Aves. in the city of Oak Creek. Oak Creek is still Milwaukee county, so when we say “in Milwaukee” we mean Milwaukee County. Another thing I did not point out. The photos of the 6th St. cut show a tall, round building in some. 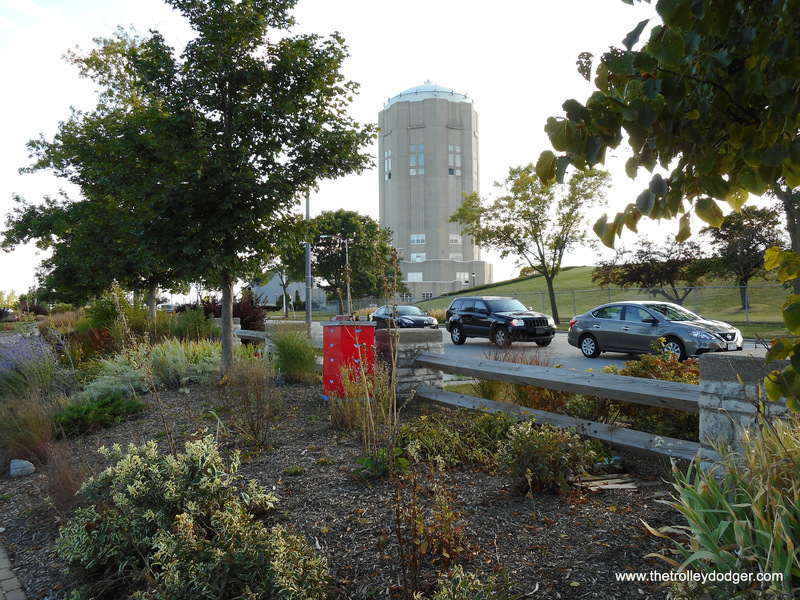 That is the old Town of Lake water tower which is no longer a water tower. It’s a south side landmark on 6th & Norwich. If you have CERA Bulletin 107 – “Route of the Electroliners,” look on page 47. 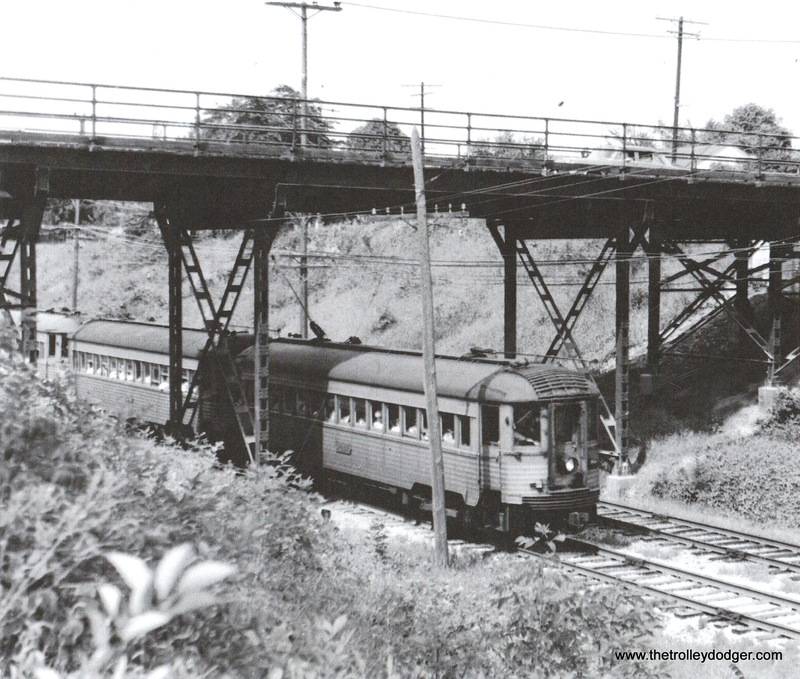 You’ll see a picture of the 1939 CERA fan trip going across the Lakeside Belt Line bridge above the 6th St. cut and at the bottom a northbound NSL train passing under Norwich Ave. 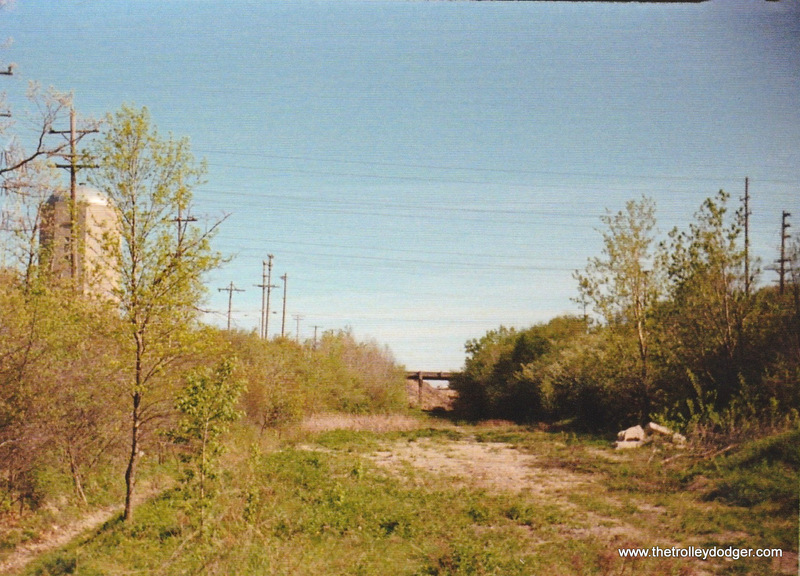 The water tower is prominent in the picture. 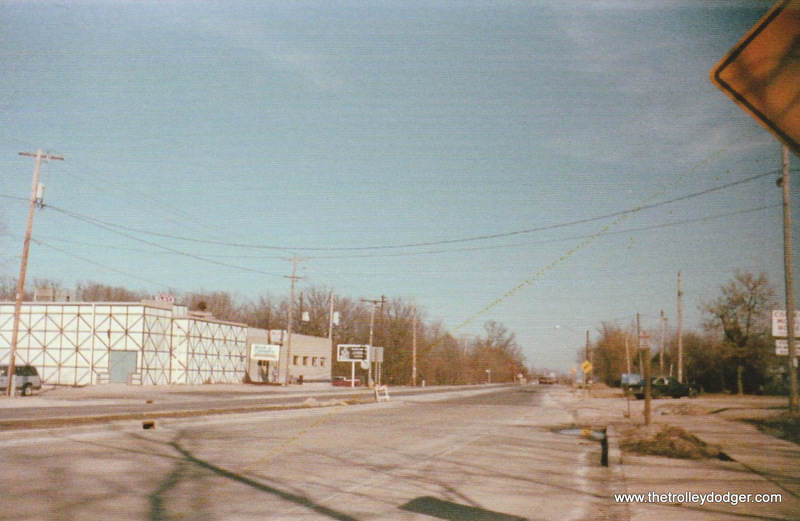 The Town of Lake was annexed by and became part of the city of Milwaukee in 1955. 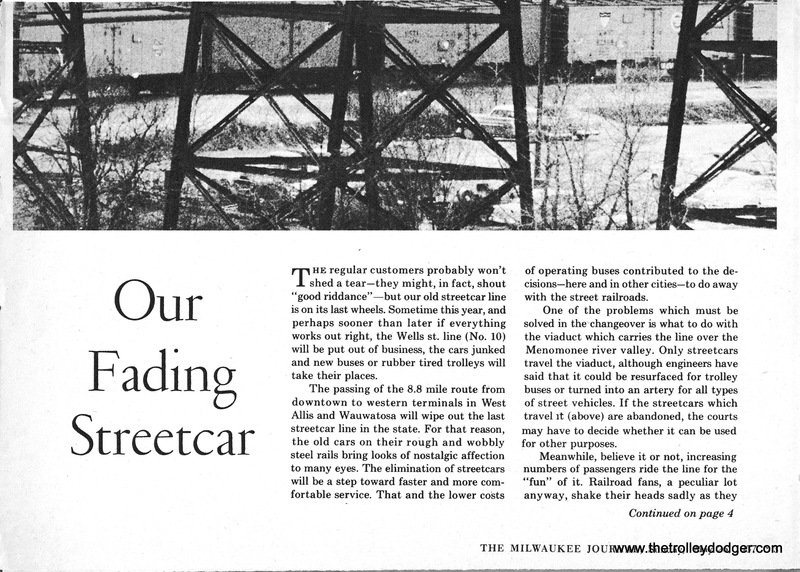 PS- No doubt you’ve seen many photos of the Milwaukee North Shore station on 6th & Michigan Sts. In nearly every shot looking north you see a tall building looming up in the left corner of the photo. The building has a round sort of structure in the center of its roof which most people assume is either a radio or TV antenna. That is the Wisconsin Tower building on the northwest corner of N. 6th St. and W. Wisconsin Ave. It used to be an office building but it was converted to condos about 10 years ago. The item on the top of the 20 story tower? Believe it or not it is a mooring mast for dirigibles like the Hindenburg which tells you the building was built in the 1930’s. The mast was never used. The other tall building seen in many NSL Milwaukee terminal photos is what used to be the Schroeder Hotel. It the ’70’s it became the Marc Plaza hotel named for its owner Greek millionaire Ben Marcus. This guy owned everything from theatres to the local Big Boy Restaurant chain. I think the hotel was sold when Marcus died. Today it is the Hilton City Centre. Thanks to Don Ross for allowing the use of his photographs. 1C Looking north at 6th & Canal Sts on 10-18-17. 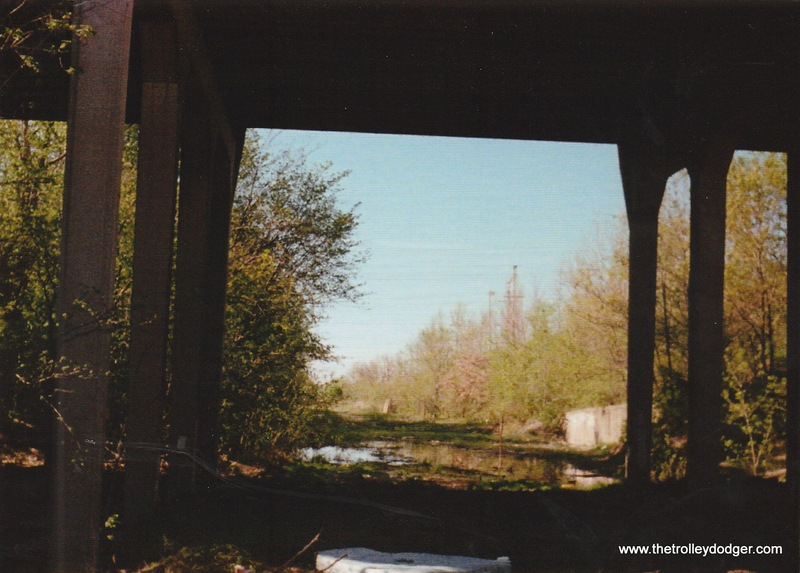 The viaduct Was torn down in 2001 and replaced by 2 bridges which meet at street level at Canal St.
3A NSL 738 sb. At 5th & Mitchell Sts. Passing Notre Dame High School & St. Stanislaus Catholic Church. Frank Butts photo from the Don Ross collection. 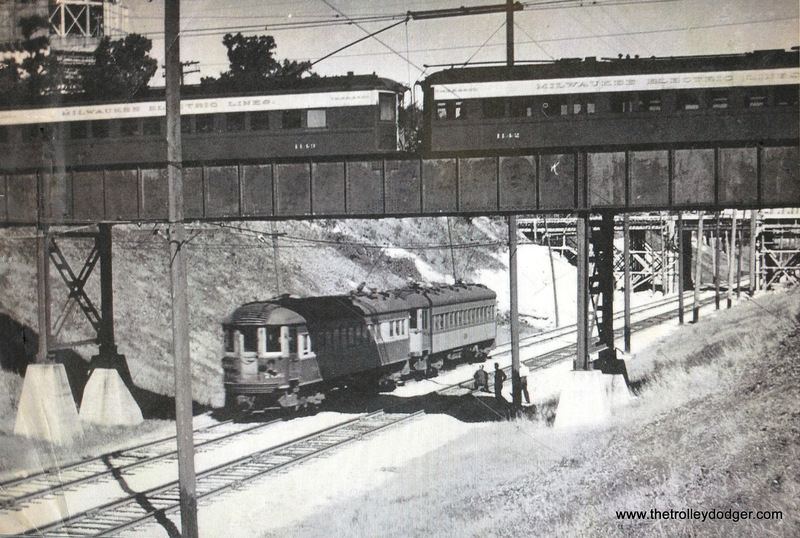 7C Tracks descending into 6th St. cut at Howard Ave. 11-3-37 City of Milwaukee Engineers Dept. 8D Looking north in the cut we see the Norwich Ave. underpass. 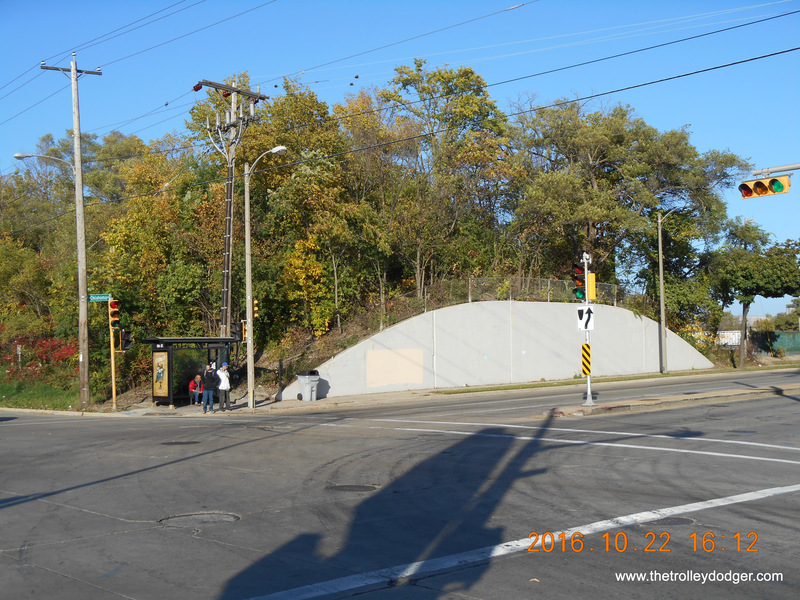 The cut ended very abruptly at this point after the cut from Howard Ave. north was filled in some years earlier. 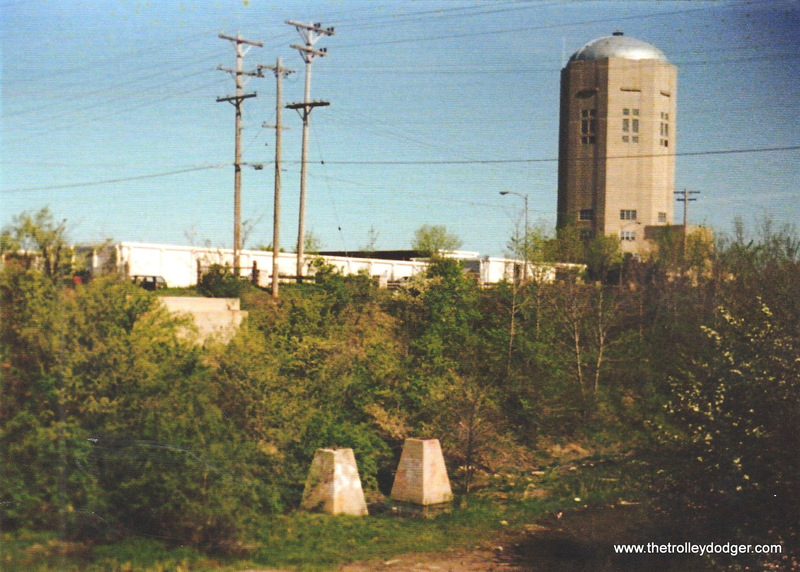 Note Town of Lake water tower atop embankment at left. 8E NSL 706 heads south passing under the TM Lakeside Belt Line bridge while a two-car CERA Fan trip (using two TM 1100-series cars) makes a photo stop. 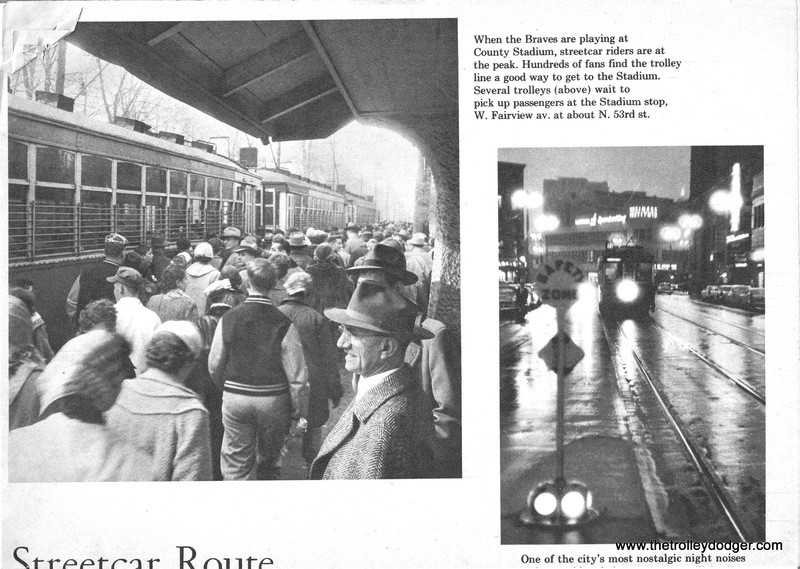 This 1939 Fan trip, and one in 1948 where car 1122 backed down the Belt Line a short distance from Greenwood Jct. are the only known passenger operations over this line. 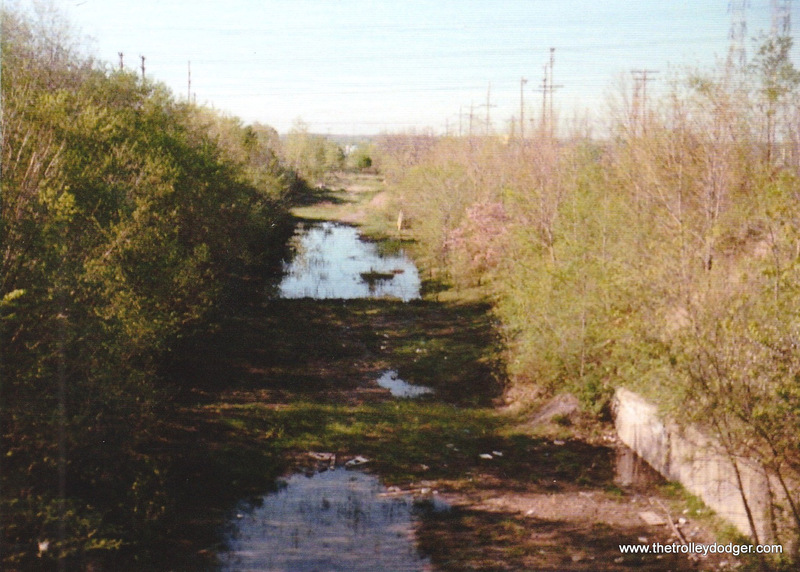 8G On May 14th, 1988 the cut was filled in and bridge at Norwich Ave. removed. 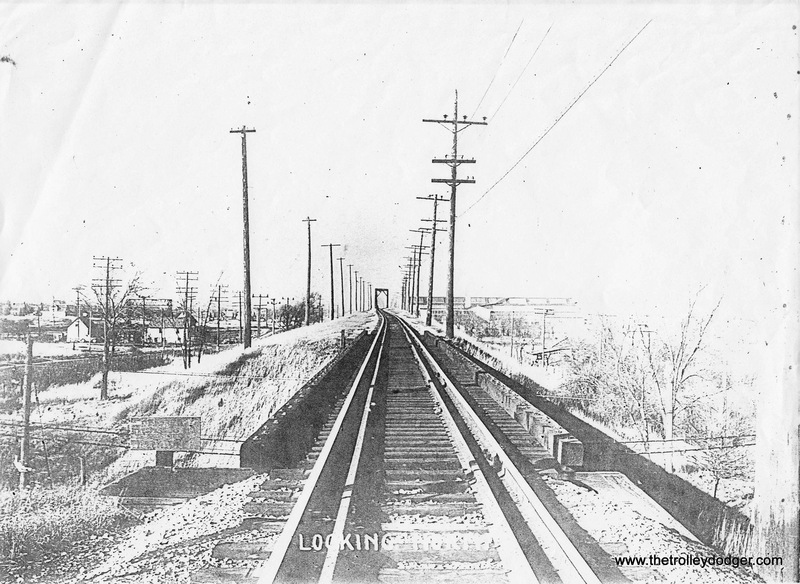 View looks south from Howard Ave.
Don Ross just sent me these Milwaukee streetcar clippings. Sure brings back memories. 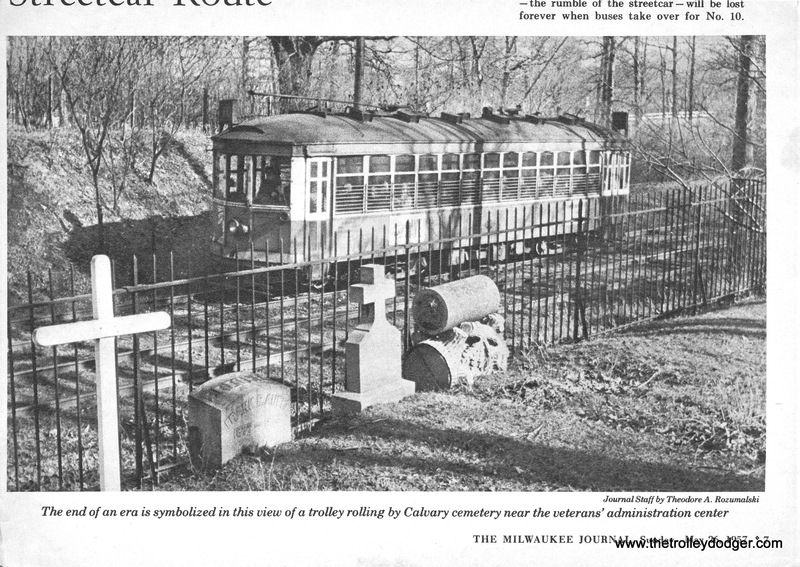 I don’t know who did the captioning for the Milwaukee Journal but some of those Milwaukee streetcar pictures were way off. 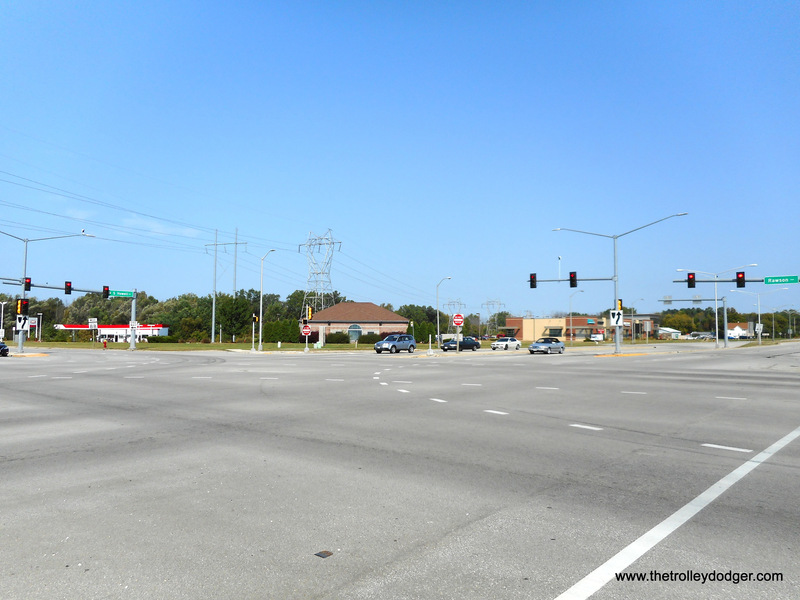 The one from above of a car coming around a curve is in the Calvary Cemetery cut and the car is approaching the stop at what was then Hawley Rd. It is not in Wauwatosa. The shot of the cars lines up at the “Stadium stop” Is nowhere near Fairview Ave which ended at 60th St. 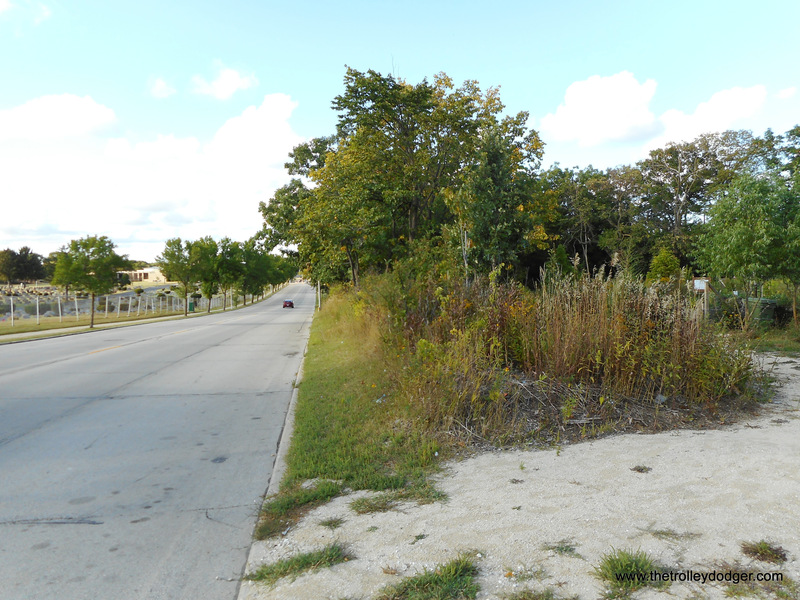 It is on the private right-of-way going north toward Wells Street parallel to N. 52nd St. on the West Allis branch of Rt. 10. 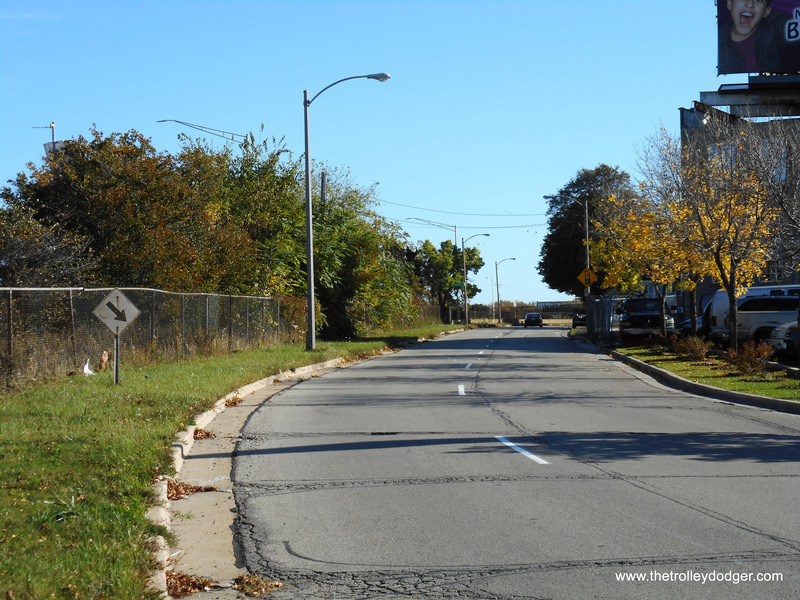 Cars turned north at the east end of the Calvary Cemetery cut while interurbans continued east to downtown. 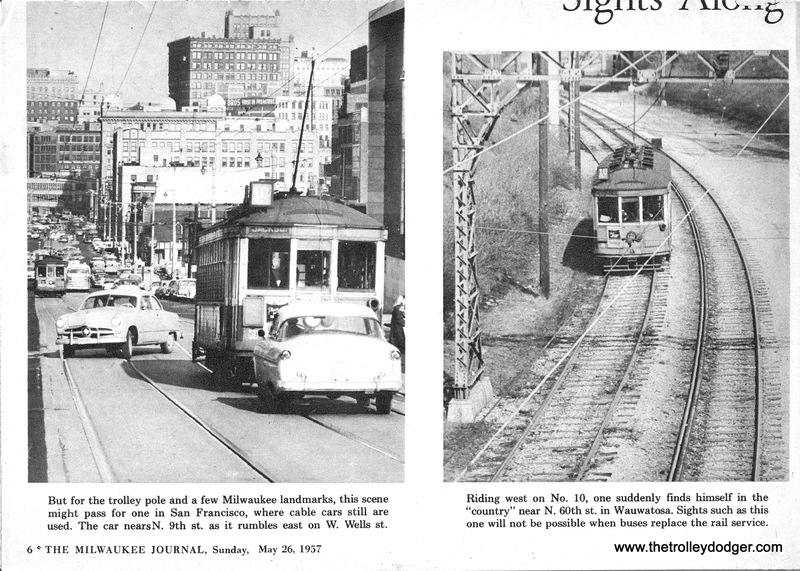 The shot that says the streetcar is nearing 9th Street is wrong. 9th Street is behind the photographer. Though you only see a fragment of it to the right of the streetcar that is Central Library’s 1957 addition which is called the annex. 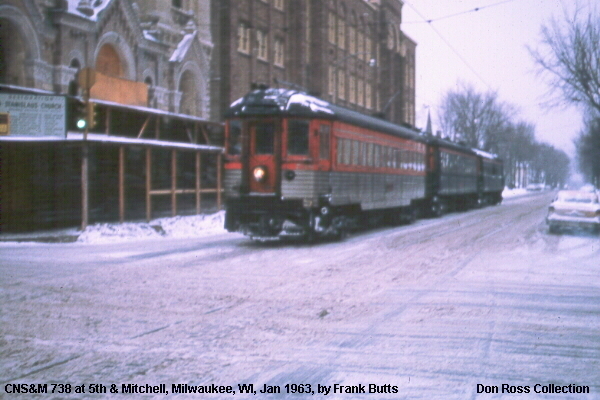 The car is almost at 8th St. Today the Milwaukee Public Museum would be on the left. 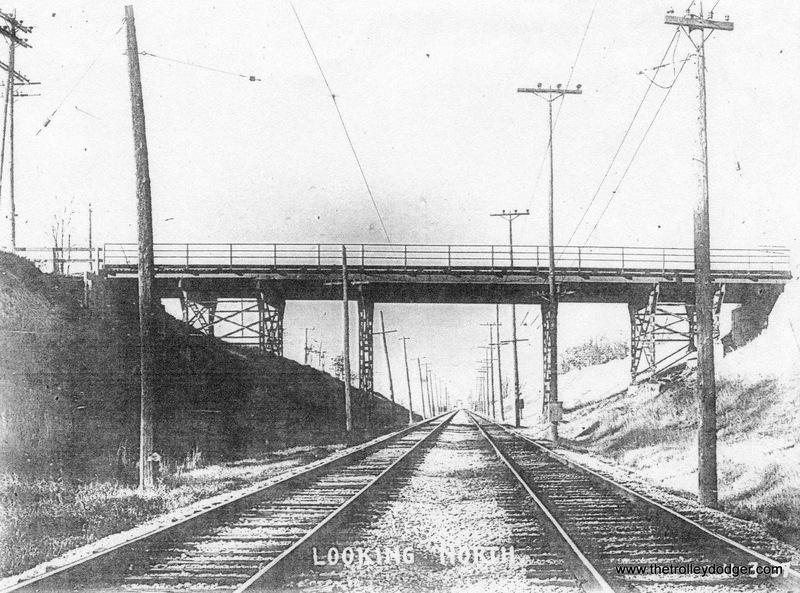 The viaduct stood for 2 years after streetcar service ended. The clever Transport Company donated it to the city. The powers that be fought over it trying to decide if they should attempt to convert it into a road, or maybe a bridge only for buses. Finally, they decided to just dismantle it since it was never a thru street to begin with. 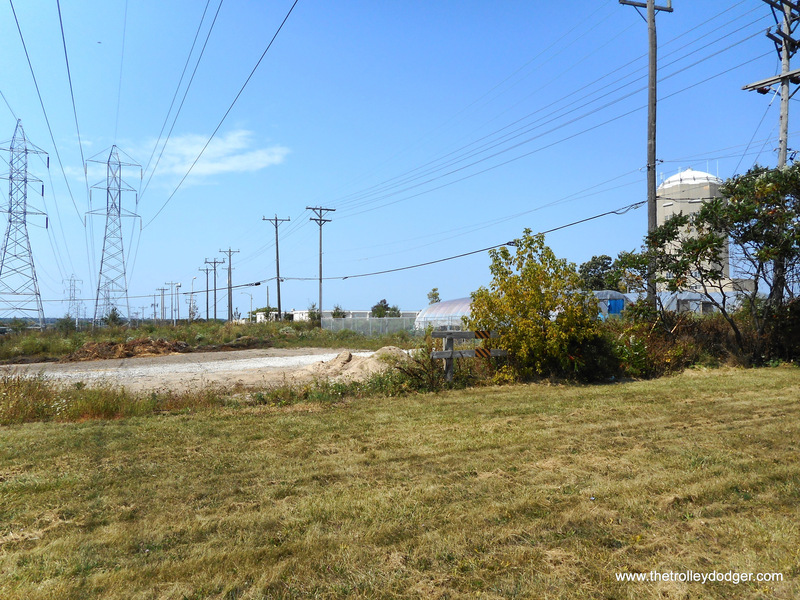 From the lakefront Wells goes west to just past 37th St. and dead-ends. It picks up again on the other side of the valley near 44th St and continues west to 68th. 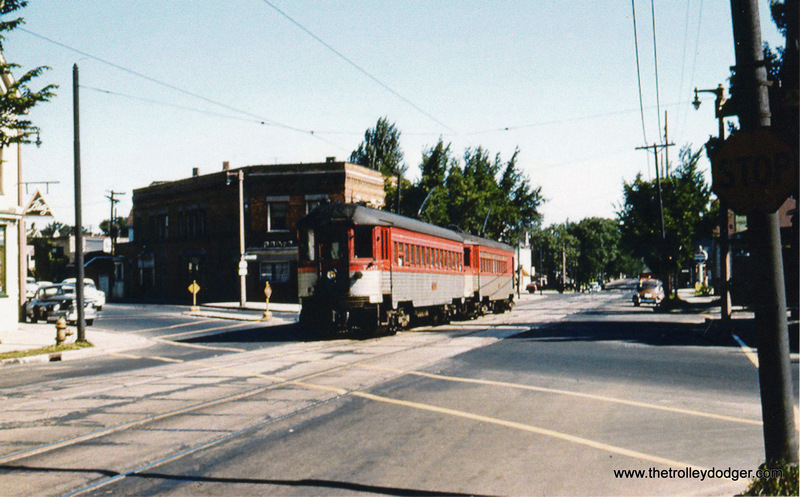 The Harwood Ave. station building was used first as an insurance company office, and later on as the sales office for a lot selling Christmas trees. TWERHS was supposedly going to save it but they didn’t. I remember it very well. It had a cement floor and at the back of the building there was a counter where you could buy candy, gum cigarettes, cigars, newspapers and weekly passes and ticket strips. My grandmother called the fare tickets “Car checks”. A week or two after streetcars ended we were going downtown again and she took a ticket out of her purse. I said, “Are we going to ride the streetcar again?” She said, No, there are no more streetcars. I said, “But how can that be? 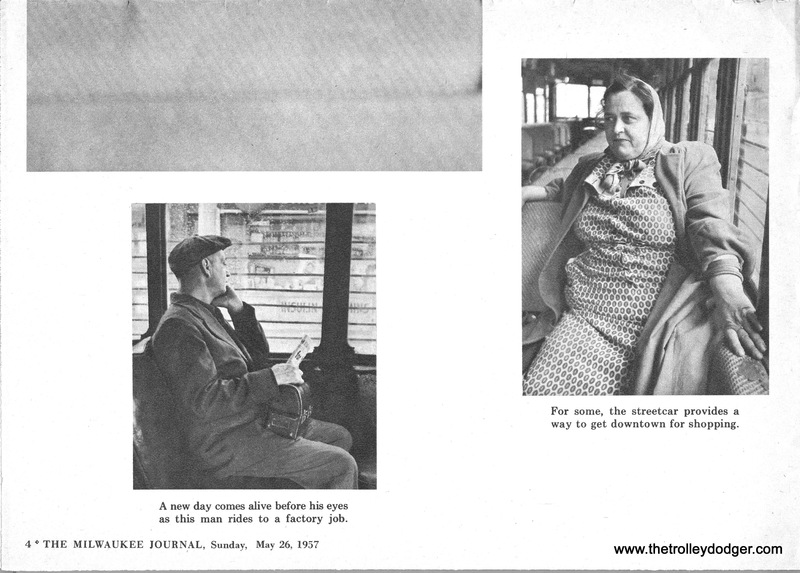 You still have car checks.” Of course she patiently explained that they could be used on the bus as well. 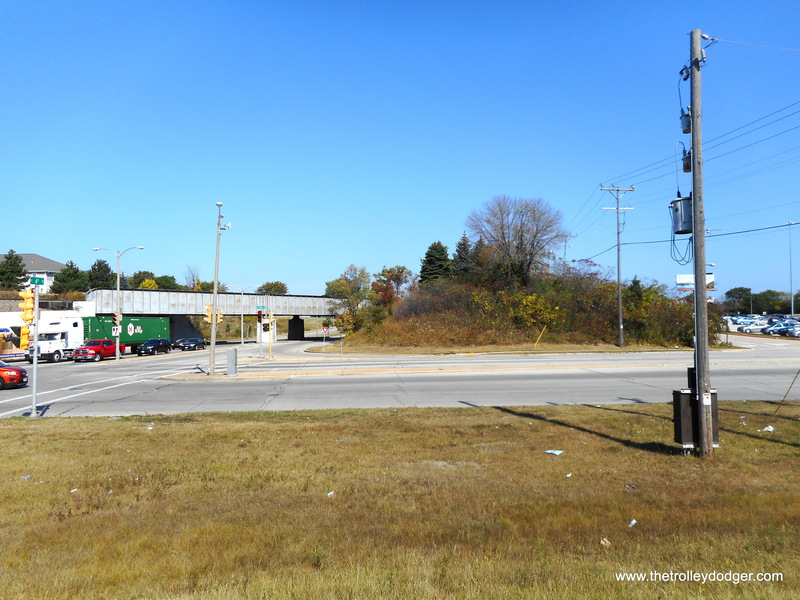 My grandfather worked at the original Harley-Davidson Plant across the Milwaukee Road tracks from Cold Spring shops. 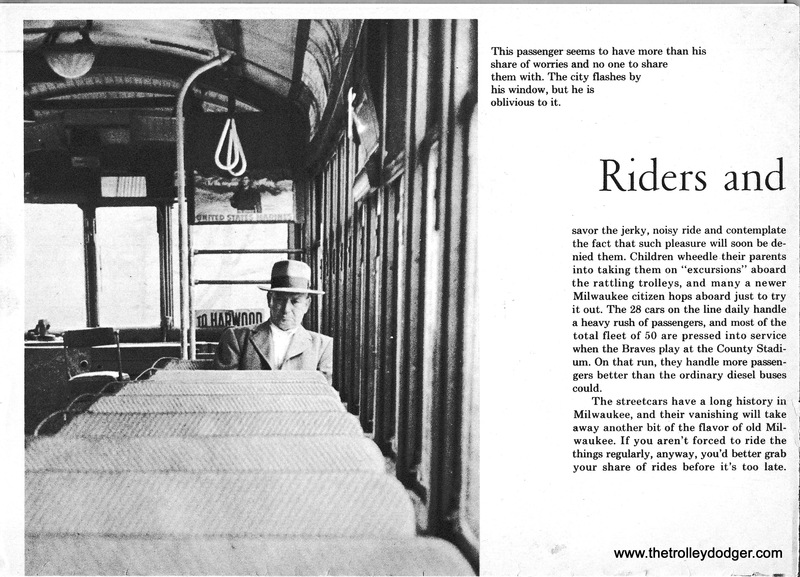 The only time I ever rode the Rt. 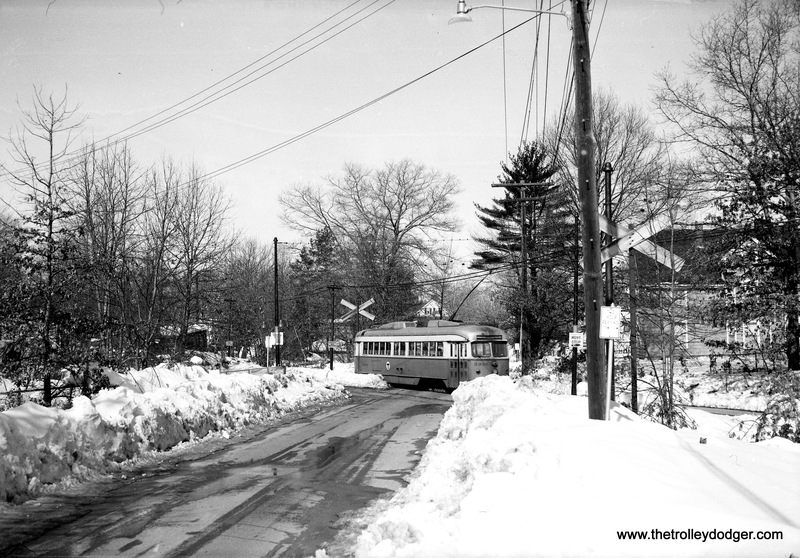 11 Vliet Street line was when my grandmother and I took it there and walked over from Vliet St. to the employee parking lot. In those days (ca. 1956) people seldom locked their cars. We waited for him to come out of work and “surprised.” Sure, he probably knew in advance. One time he did show my brother and I around the plant. He had to go up to the office on a top floor to collect his pay check. He took me to a window and said, “You see those buildings down there? That’s where they fix the streetcars.” I didn’t see any streetcars so I didn’t believe him. 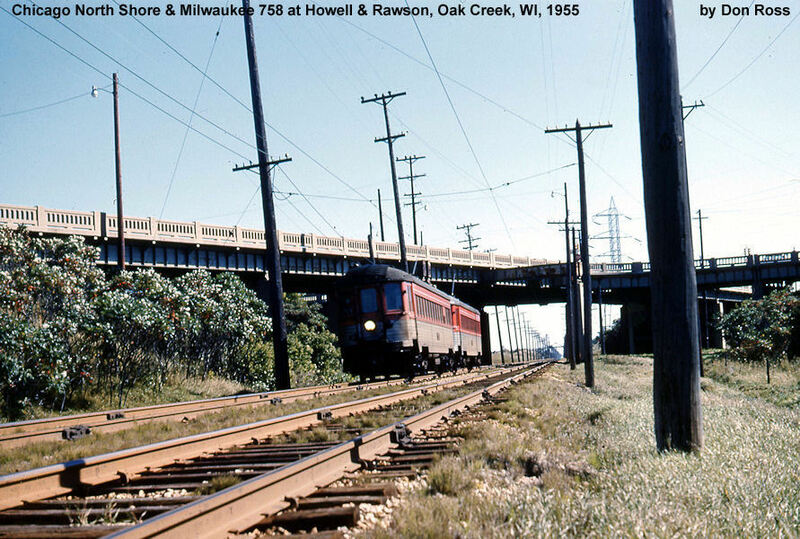 The Milwaukee Road mainline from the Twin Cities ran right past the Harwood station and I Remember seeing the Hiawatha a couple of times. 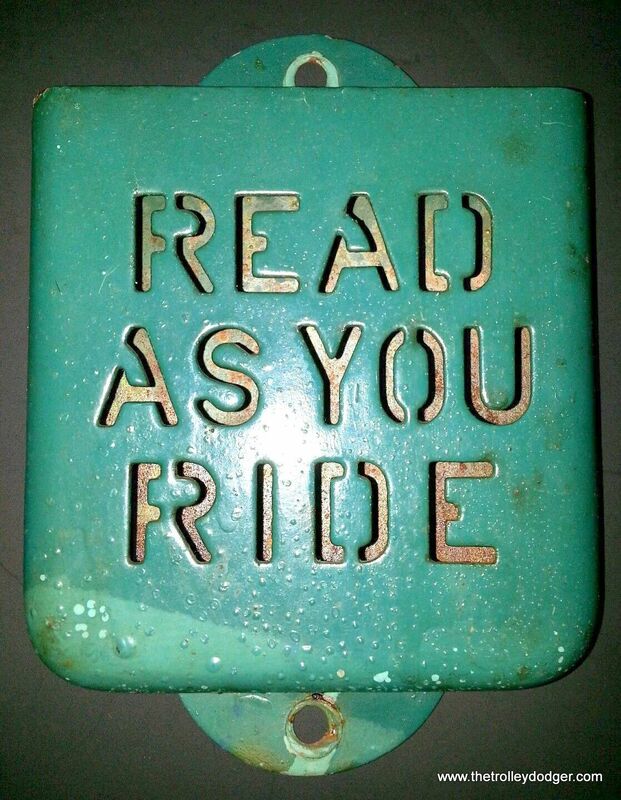 In 1965 my grandmother, mother and I rode it from Chicago to Milwaukee and sat in the Super Dome. 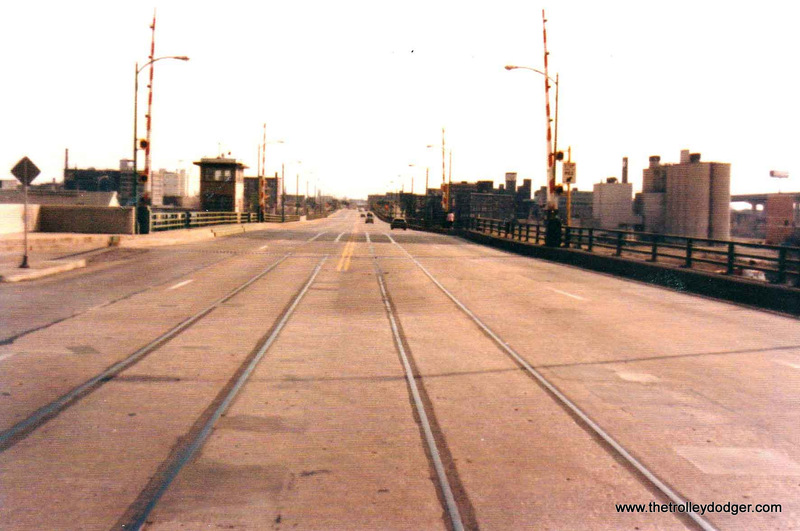 I remember when we left Chicago and started going beneath those signal bridges around Western Avenue I ducked. Later on when Amtrak started up I rode the full length and half length GM and Burlington Dome cars they used on the Empire Builder. The present day Superliner lounge cars do not compare with the dome cars. 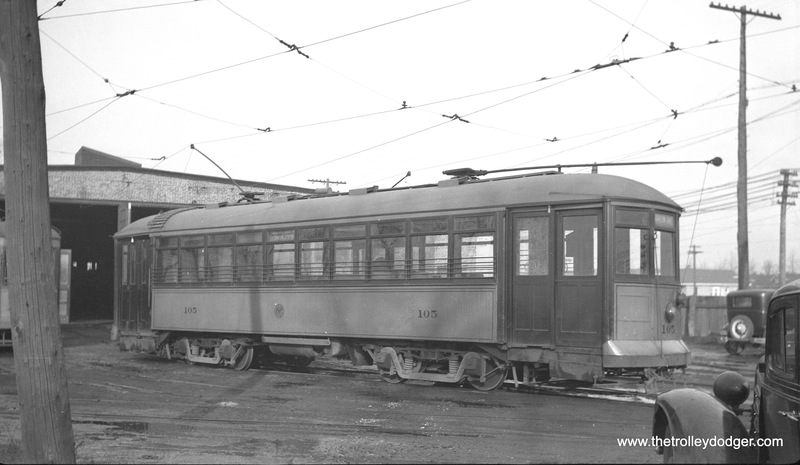 Chicago & West Towns 105 at the Riverside car barn in the 1930s. This car was built by McGuire-Cummings in 1915. 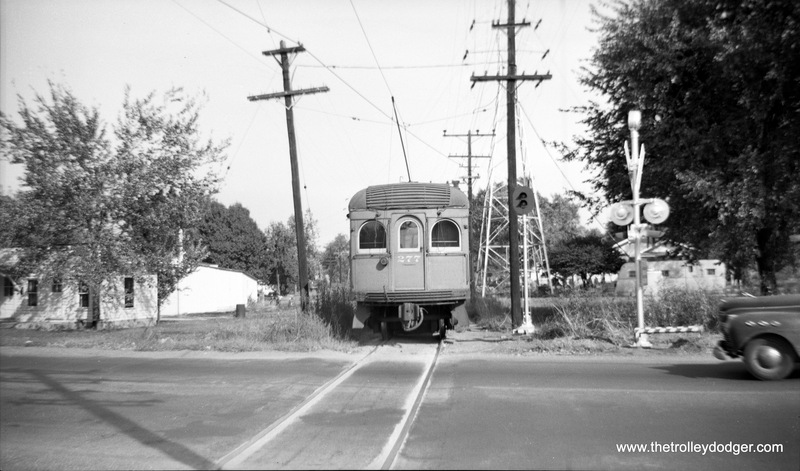 Portland Railway Light & Power “Master Unit” 810 in Portland, Oregon on July 3, 1948. 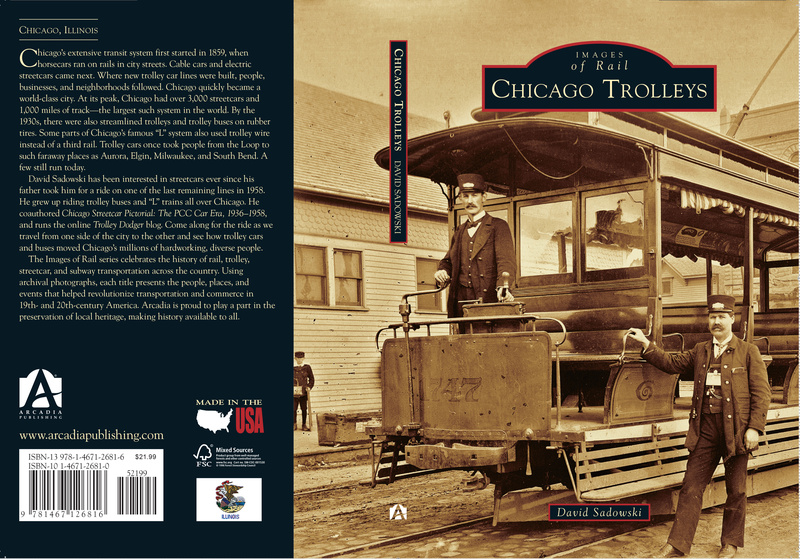 We would like to thank everyone who turned out for our Chicago Trolleys slide presentation last week as part of the Chicago Authors series at the Museums at Lisle Station Park. Watch this space for information about upcoming events. This is our 198th post, and we are gradually creating a body of work and an online resource for the benefit of all railfans, everywhere. To date, we have received over 333,000 page views, for which we are very grateful. Wonderful. 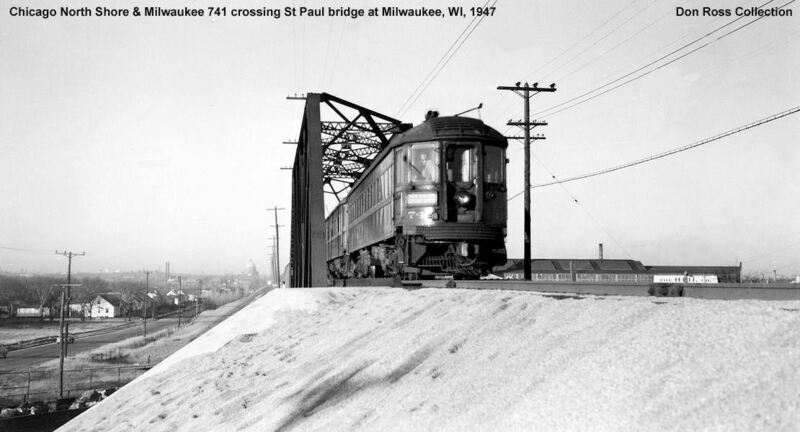 I remember riding the North Shore in 1949 and 1950 to Milwaukee when I was in the Marine Corp and stationed at Great Lakes. 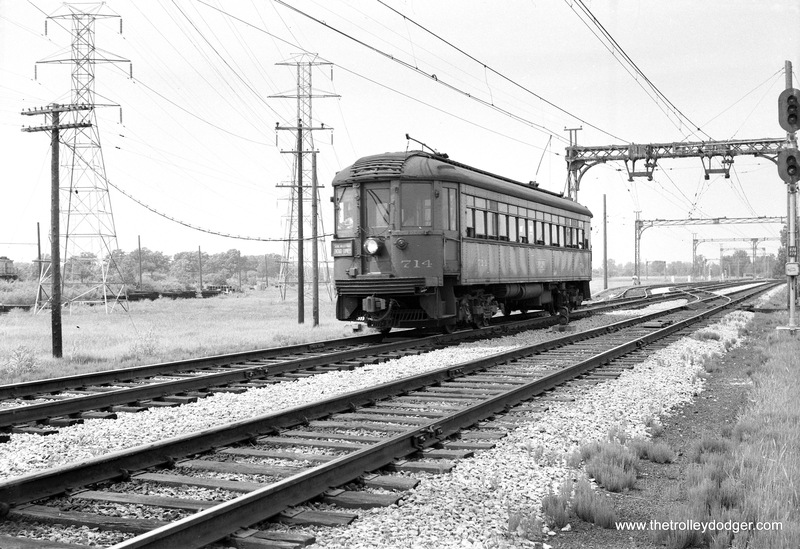 In September 1950 (Labor Days weekend) I was planning to ride the Speed Rail on an excursion. Unfortunately I was transferred to San Diego (to finish electronics school) in August. Very disappointed then but glad I didn’t go when I read what happened. 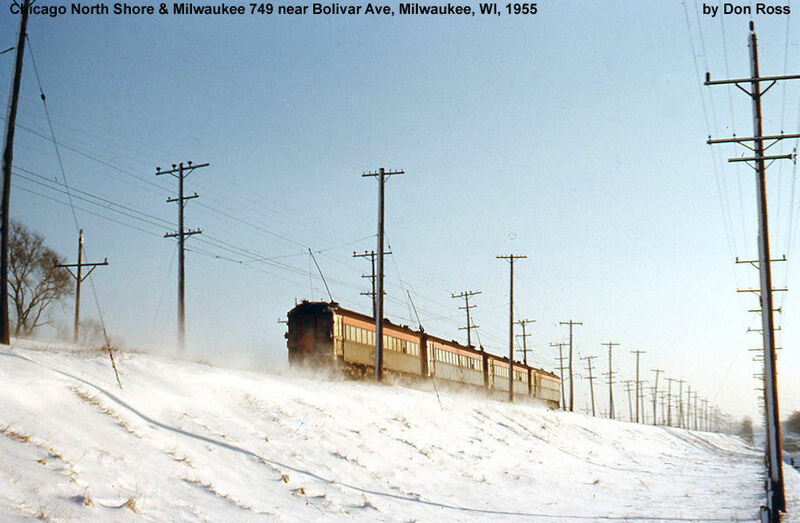 In the summer day of 1950 I watched a Milwaukee Road train pulled by a 4-6-2 starting to leave the Milwaukee Road station (down the hill from the North Shore station) when the lead trucks on the locomotive derailed. Later I worked on railroads for many years (NYC, Penn Central, Conrail, New York City Transit Authority) and never saw a derailment actually happening. Thanks for sharing that. Glad you like the article. Just out of curiosity, what use is the old water tank being put to now? I believe the 1,000,000-gallon tank is no longer used – for quite some time now – but the first-floor offices are used by some City of Milwaukee departments. I know the health department was there in the late 80s – early 90s, but I do not know which departments use those offices today. 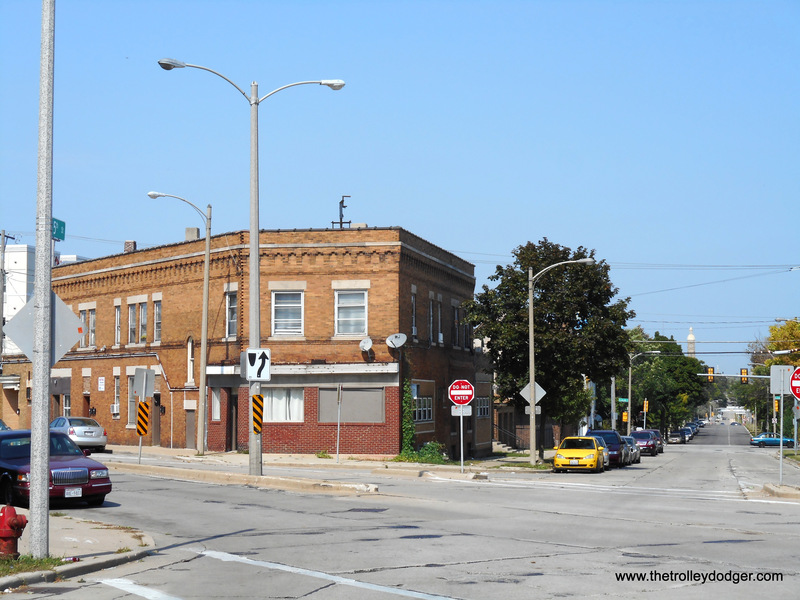 The former Town of Lake Water Works and Municipal Building, which officially opened in January, 1940, was certified as a City of Milwaukee Historic Structure in February, 1990. It was renamed the Robert Anderson Municipal Building a number of years back, honoring the longtime Milwaukee alderman for that district. There is a plaque on the front of the building, next to the front entrance, which briefly documents the town’s colorful history. 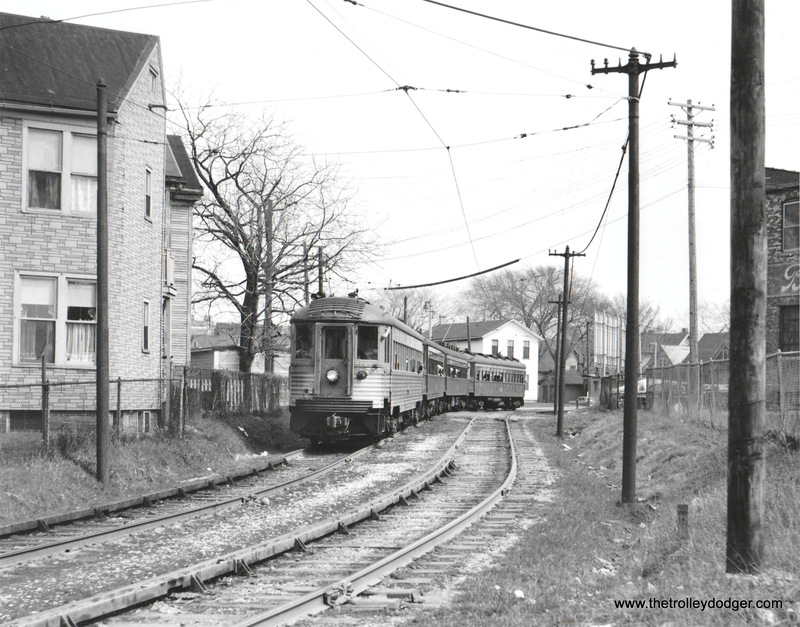 So sad that the North Shore Line is gone, but thank you for these photos which document the places where the line ran. While often sad, these pictures are very interesting and informative. My childhood home was at 12th and Washington Streets on Milwaukee’s near south side. As kids, we played at Walker Square. (“Square Park”). 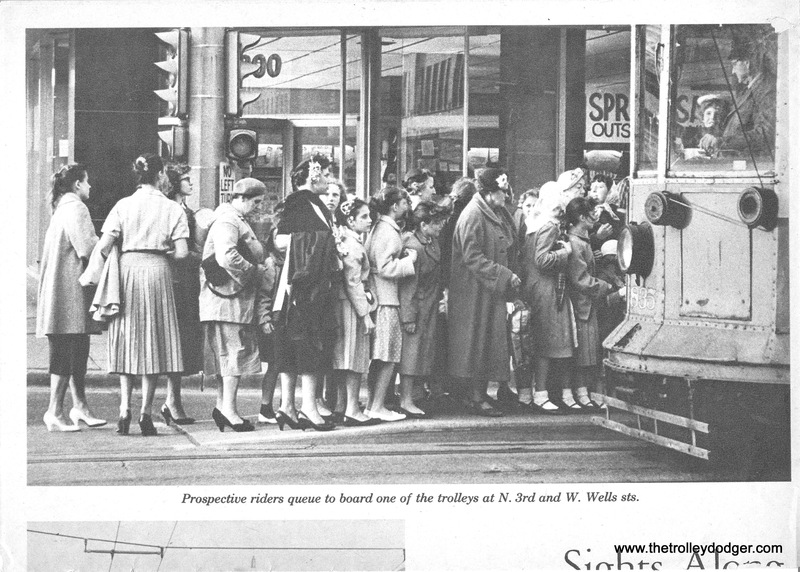 Sometimes we walked down to 6th street and waited for a passing North Shore Line train, and to get a “wave” from the motorman. 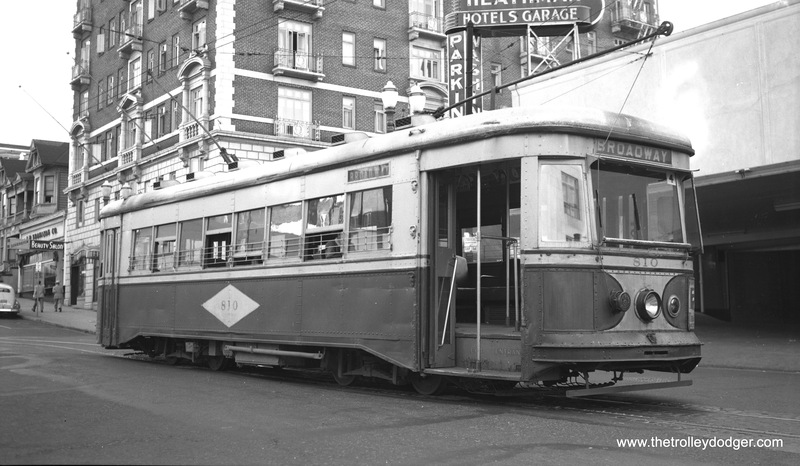 Just past Washington Street was the private ROW cutover trains took to get 5th Street to 6th Street. 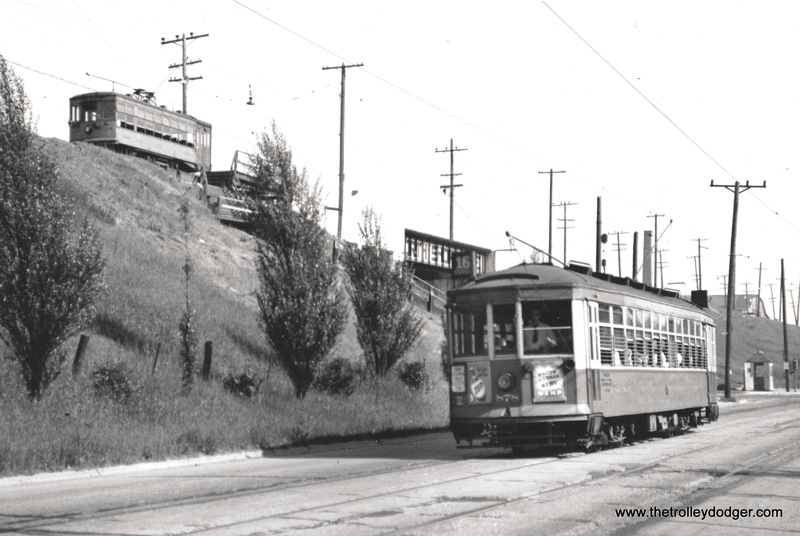 Later in life, part of my driving instruction was on South 6th Street and across the viaduct to Downtown. 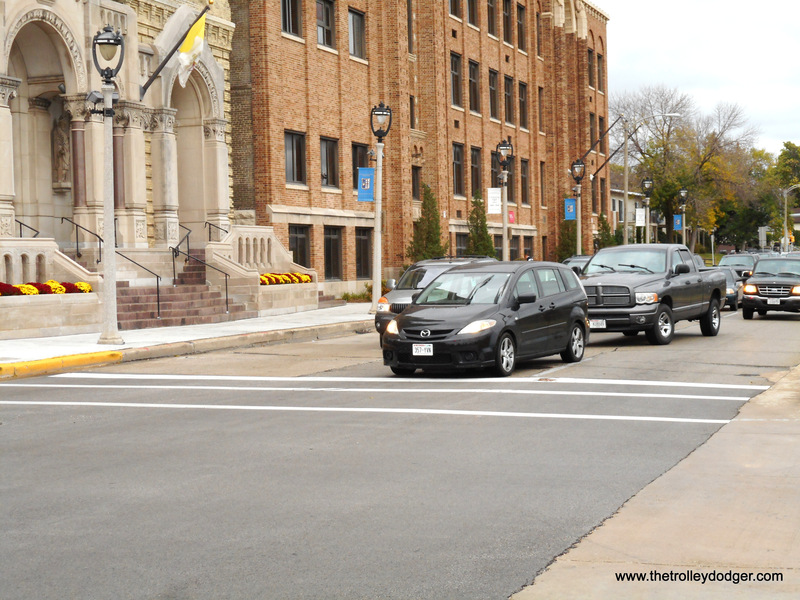 It was quite an experience to have an Electroliner approach you from behind at a stoplight and stop right behind you! This was an excellent article, thank you so much. Thank you for all the work and research to share this wonderful article. Living on the south side and being familiar with these areas, this puts in perspective all that was here and what is now lost. 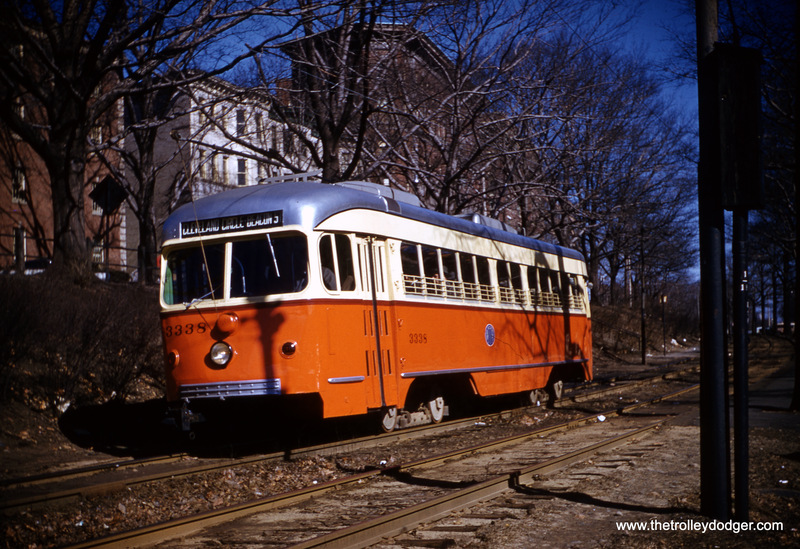 This inspires to explore and learn more and help imagine our city in ways it once was. The Shroeder Hotel/Marc Plaza is still owned by the Marcus Corporation, which is lead by members of the Marcus family. 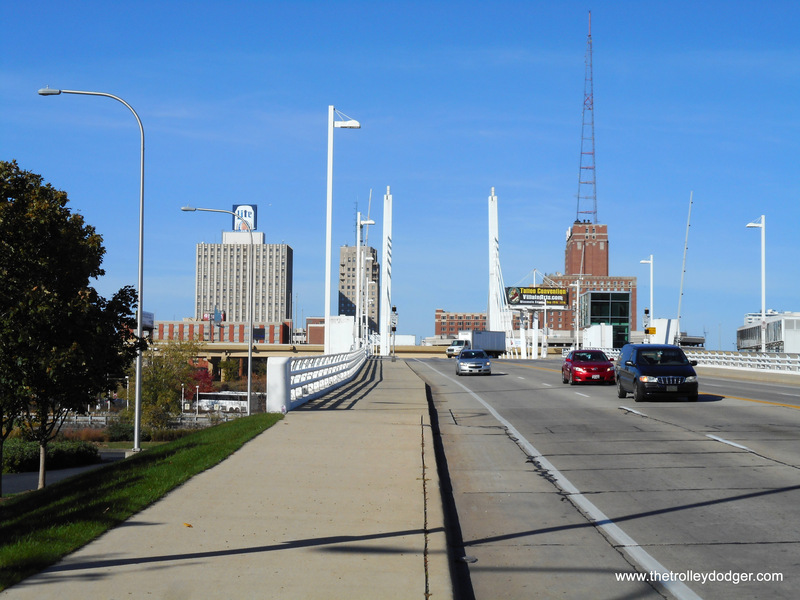 It is currently managed with a Hilton brand affiliation, as the Hilton Milwaukee City Center.